We have a FULL RANGE OF PRODUCTS to complement our programme and make learning at home fun for all the family! Our original DVD 'Sing and Sign' (awarded a platinum disc by the BPI) teaches you all you need to know to sign at home with your little one. 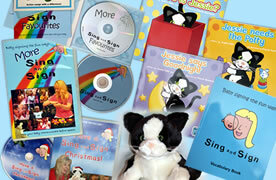 We also have our follow on DVD 'More Sing and Sign - Stage 2' and a 'Have a Sing and Sign Christmas' DVD too. If you would prefer these titles streamed to your tablet, pc, smart TV and phone then you'll may like to consider membership of Sing and Sign Online instead. Also in our shop, our range of CDs contains over 50 songs, with gentle musical arrangements and instrumentation to help you sing and sign at home. Find out what others think about baby signing. The Ultimate Baby Signing Resource! Britain's first ever baby signing classes has a birthday! Fifteen years and going strong! Sing and Sign named "Best National Toddler Development Activity"